Creating unity in the community by celebrating music, food and resources: This has been Good in the Hood’s mission for 26 years. 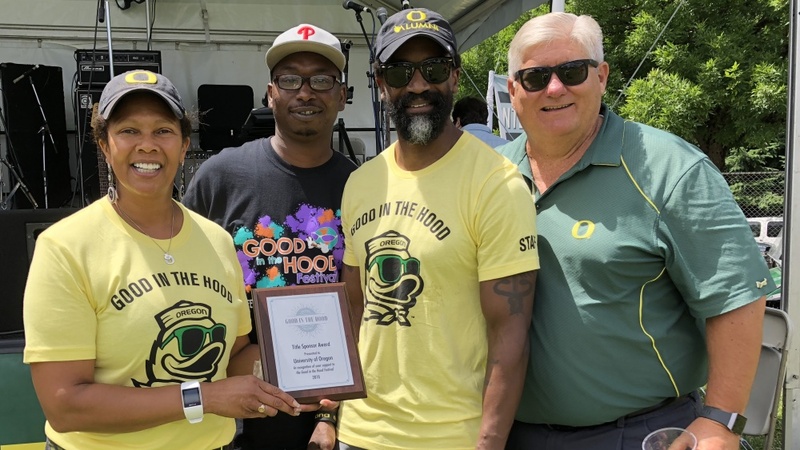 This year the Portland festival’s organizers honored the University of Oregon with the Title Sponsor Award, recognizing the five-year partnership to expand access to the community values of northeast Portland. Accepting the award for the university was Joelle Goodwin, former Mrs. Oregon and currently the UO’s senior associate director of admissions. At the three-day event, student ambassadors welcomed community members to the UO booth, the Duck came out to play and staffers connected with families in the Portland community. To learn more about summer events the UO is sponsoring, visit the Around the O story with links to volunteer opportunities.